These large (300ml) soy wax candles with two wicks are hand-poured in small batches in Manchester. They have a burn time of 55 hours are made using natural soy wax, high-quality and paraben-free essential oils, fragrance oils and organic cotton wicks. Black Amber & Lavender - This relaxing candle is a blend of rustic amber and french lavender with added notes of tonka bean, vanilla and clary sage. Ginger & Green Tea - This candle has a clean, invigorating aroma with subtle notes of green tea and spicy, pungent notes of ginger blended with additional citrus notes of grapefruit and mandarin. Lime & Basil - This fragrance combines fresh, zesty citrus notes of lime and mandarin undertones with notes of basil and herbs. The candle comes in an amber glass jar that is simple and contemporary and comes with a golden oak stained wooden lid which helps keep the dust out and the scent in whilst also being completely plastic-free. Each candle also comes in kraft box which makes it ideal as a gift for a friend or loved one. Ingredients - Natural organic soy wax, paraben-free essential oils and fragrance oils. Materials - Organic cotton wick. Product Packaging - Amber glass jar, golden oak stained wooden lid & kraft box. Cedar Candles is a natural home fragrance brand run by Elizabeth who makes each candle by hand in small batches in Manchester using the finest quality soy wax and premium fragrance oils. 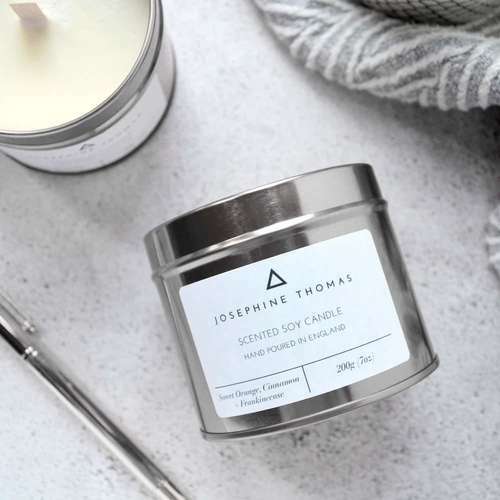 Elizabeth wanted to create a candle making company which had a minimal impact on the environment and all packaging for the product itself and delivery packaging is zero waste. Postage Packaging - Craft paper & paper tape.